When most people discuss winemaking, the usual topics of conversation generally come to the fore: What region the grapes are from, whether the juice was fermented in oak or stainless steel, how long it's aged--if at all--in oak barrels, etc. 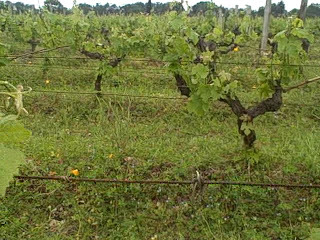 Interestingly enough, though, the conditions of the vineyard in which the grapes were grown is all too rarely addressed. Which is unfortunate, because the astounding range and number of decisions that must be made regarding the vineyard has a huge impact on the final product that ends up in your glass. Take a look at the video below. I shot it at Chateau Smith Haut Lafitte in Pessac-Leognan when, walking across the property, I noticed how incredibly different the land was being treated on either side of the gravel walkway I found myself on.